Intel today announced the availability of the Intel® Stratix® 10 MX FPGA, the industry’s first field programmable gate array (FPGA) with integrated High Bandwidth Memory DRAM (HBM2). By integrating the FPGA and the HBM2, Intel Stratix 10 MX FPGAs offer up to 10 times the memory bandwidth when compared with standalone DDR memory solutions1. 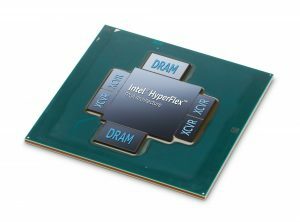 These bandwidth capabilities make Intel Stratix 10 MX FPGAs the essential multi-function accelerators for high-performance computing (HPC), data centers, network functions virtualization (NFV), and broadcast applications that require hardware accelerators to speed-up mass data movements and stream data pipeline frameworks. 1As compared to a standard DDR 2400 DIMM. See the “Intel® Stratix® 10 MX Devices Solve the Memory Bandwidth Challenge White Paper” at https://www.altera.com/content/dam/altera-www/global/en_US/pdfs/literature/wp/wp-01264-stratix10mx-devices-solve-memory-bandwidth-challenge.pdf for more information.